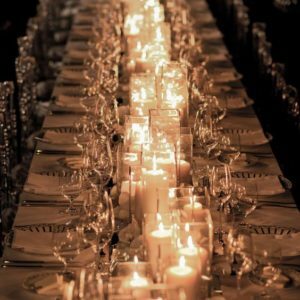 Whether you’re hoping for a romantic night at home or you’re prepping for a big party or event, a little extra love in the decor department goes a long way. And, as much as we love fresh-cut flowers, filling your space with seasonal stems can get pricey. 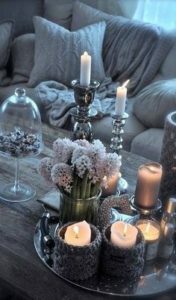 To achieve a similarly enticing look, sub (most of the) flowers for candles and voila—your space is transformed into a festive (and often sweet smelling) area for entertaining, a big event such as a wedding or graduation, or even a special dinner date. We’ve rounded up 10 of our favorite uses for candles—including a DIY fireplace, a romantic bath, and even a chandelier, below. Pro Tip: purchase inexpensive large white unscented candles in bulk online in various sizes, and place in clear cylinders. These sturdy holders will prevent wax drippings, and the candles can easily be used in various locations, both indoor and out. If using tea lights in smaller jars, put a tablespoon or two of water at the bottom of the jar to prevent wax from the candle sticking to the jar. 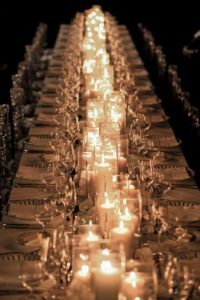 Battery operated candles can also offer a similar glow – particularly when set above eye level – and never need to be replaced. 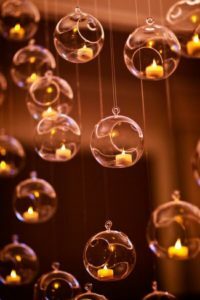 We love these in chandeliers, or for outdoors when regular candles could blow out. Plus, you never have to worry about fire! 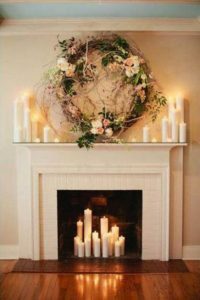 Originally designed for a wedding altar, this candlelit fireplace would be romantic any day of the year. 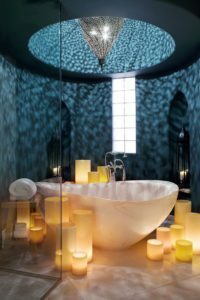 These bathrooms are next level with their candlelit glow. 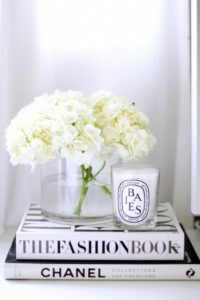 Add a scented candle to the guest or powder room for a homey touch. Candlefish, in Charleston but sold online, has some of our favorite varieties. 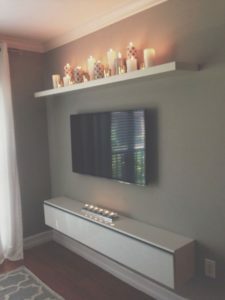 This over the TV mantlepiece transforms Netflix to a new dimension. 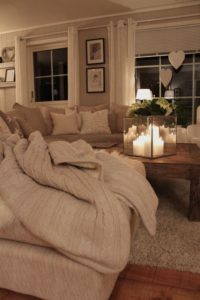 Candlelit coffee tables create a cozy space any time of year. These candles + flowers transform a space. 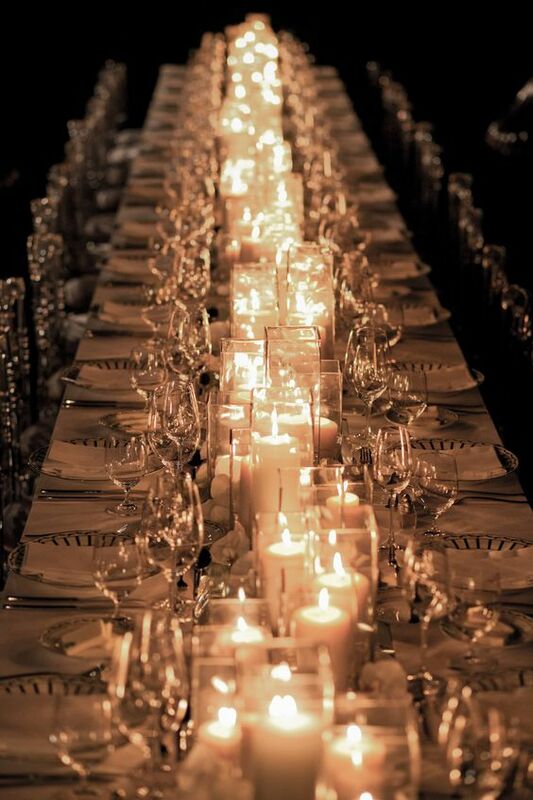 Candles down the center of a table create a festive feeling for a dinner party. Hang tea lights from trees for a fancy outdoor affair. 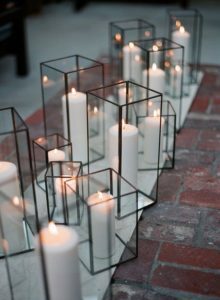 These modern candles would look great lining the walkway to your home.